The British Olympic Association (BOA) and British Paralympic Association (BPA) are monitoring developments. A BOA spokesperson added its medical team had been liaising with specialists at the London School of Tropical Medicine. The BPA said, as part of its planning for Rio, it had shared advice on medical preparations for travel with National Governing Bodies (NGBs), including information on mosquito bite prevention. It said its advice to NGBs and athletes on travel to Brazil is unchanged. The Olympics open on August 5 and close on August 21. The IOC said Games venues would be regularly inspected to ensure puddles of stagnant water - where mosquitos breed - are removed, minimising the risk of athletes and visitors coming into contact with the insects. It added it was in close communication with the World Health Organisation (WHO) and the Rio 2016 organising committee, which itself is in regular contact with the Brazilian Ministry of Health and the Municipal Health Department. The organising committee will continue to follow virus prevention and control measures provided by the authorities, and will pass on relevant guidance to competing athletes and visitors. The WHO, meanwhile, will convene a meeting on Monday to decide if Zika should be treated as a global emergency. 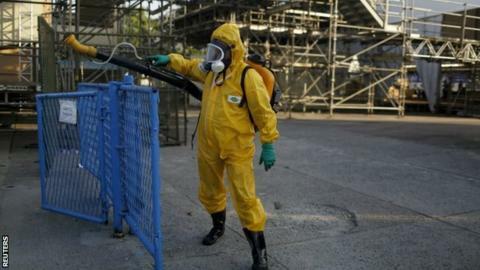 Between three and four million people could be infected with the virus in the Americas this year, experts have warned.